When Alyssa sat on Casper’s back, the giant horse seemed to become hyper-aware of her presence and remained perfectly still. 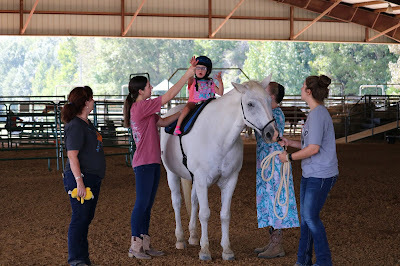 As the riding aides began to coax him out into the arena, Casper’s careful movement reflected the respect and admiration he had for my disabled daughter who proudly adorned his back. The mere sight of such as small and seemingly fragile child riding gracefully on a huge animal in comparison can be a bit perplexing for those witnessing the act for the first time. Writing has always been my passion. It is the one thing I have known without a doubt that I am meant to do with my life. For me, there’s something freeing about writing. It gives me an escape and a much-needed break from reality. It allows me to have full control over the story that I am orchestrating. I am the creator—the inventor of my world. It is a fulfillment unlike no other. A mother’s intuition can be very powerful and kick in the first moment she lays eyes on her newborn. It was within the first few moments of meeting my daughter that I knew in my gut that something was different about her. 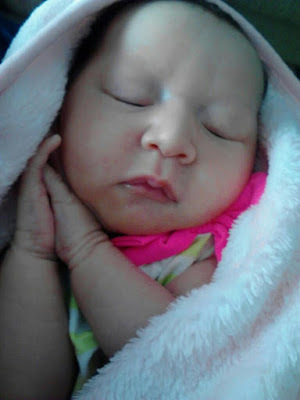 She lacked expression and eye contact—something that could easily be written off as typical newborn behavior—but I knew there was more to it than just that. 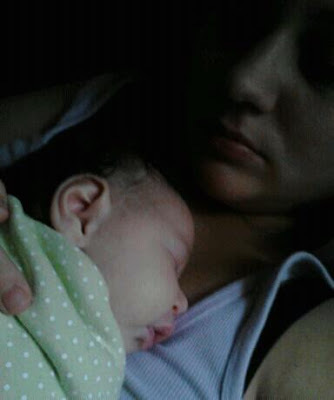 Even holding her felt different, and I felt like a horrible mom for thinking about it. I never expressed my concerns during those first few days because I wanted to wish it away and prove my gut wrong. I wasn’t ready to face the harsh reality of what my feelings could mean if proven right. Alyssa slept a lot those first two months, giving me a short window of time to enjoy my newborn just as she was. As Alyssa started to stay awake more, it became glaringly apparent that something was not right. Her eyes would move side to side uncontrollably. She couldn’t focus or track objects because her eyes were always in motion. She wouldn’t even respond to light. There was no more time for denial. It was clear what the next step would be, and I started preparing myself for the news to follow. 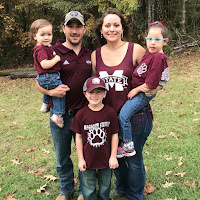 Alyssa was referred to a pediatric ophthalmologist in Jackson, MS. Dr. Mungan confirmed that she had nystagmus (involuntary eye movement) and told us it was because of vision loss. 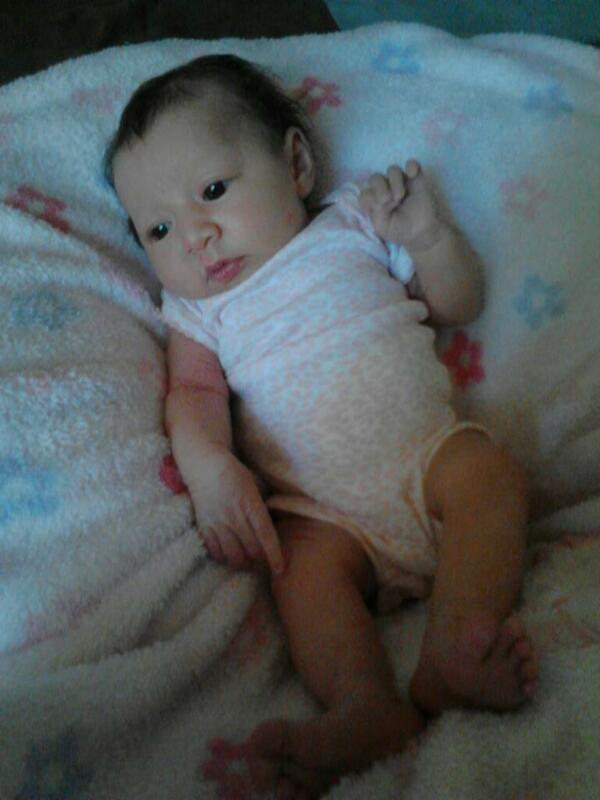 Her eyes were completely healthy, therefore the doctor said her vision loss was neurological and ordered an MRI. She was only five months old at the time. We were told by Dr. Mungan (before ever seeing the MRI results) that Alyssa was totally blind with no light perception on October 16, 2013. My world was turned upside down that day, but I refused to let it break me. I knew that now more than ever I had to be strong for her. The next step was getting her MRI and seeing a neurologist. On November 13, 2012, Alyssa was seen by her neurologist, Dr. Lee. He told us her MRI was abnormal and that she had cortical blindness and microcephaly. 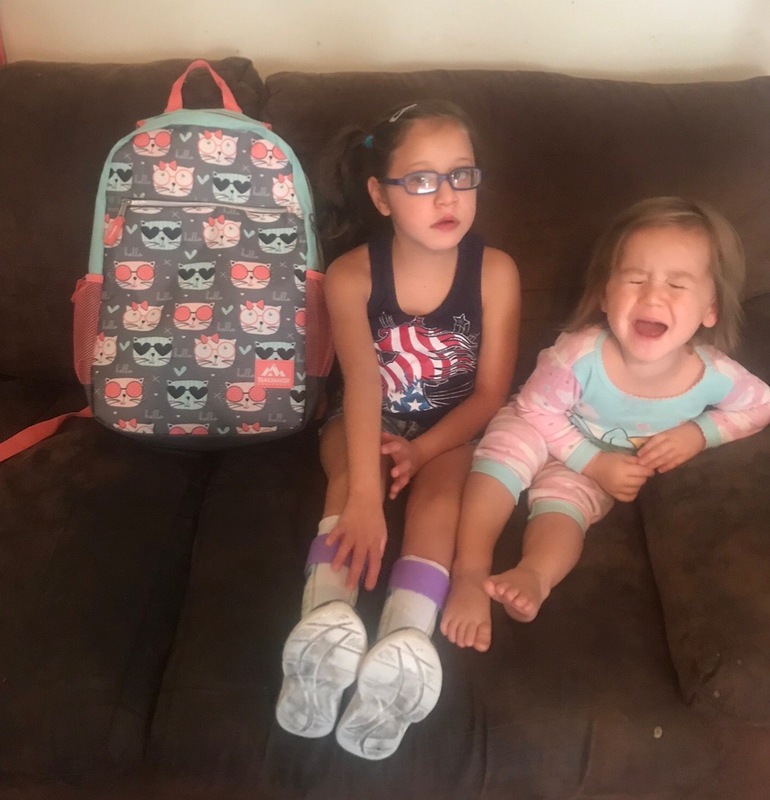 Alyssa had been misdiagnosed by her pediatric ophthalmologist (something that is very common among children with CVI). Alyssa was also diagnosed with periventricular leukomalacia (PVL) at a later MRI. PVL is a white matter deficiency in the brain that is often caused by lack of oxygen. The doctor briefly described cortical blindness. He referred to her brain as a computer and her eyes as a camera. He said the camera was working fine at collecting the images and transmitting them to the computer (brain), but there was a problem with the way the computer processed the images. His explanation made sense, but there were still so many unanswered questions. For a long time, it appeared Alyssa was blind. Her nystagmus seemed to slowly get better, but she still wasn’t focusing or tracking. She would not smile, laugh or look at me. She looked past me—as if I wasn’t there. That was the hardest part, as well as not seeing her show emotion. I contacted First Steps Early Intervention through the State Department of Health (go to your local Health Department and ask to speak with a First Steps caseworker). She was then evaluated to see which services (therapies) she would need. Her vision started improving around five months old. It seemed as though she would see certain things and track, but it was never consistent. She finally started smiling and laughing at five months old, as well. 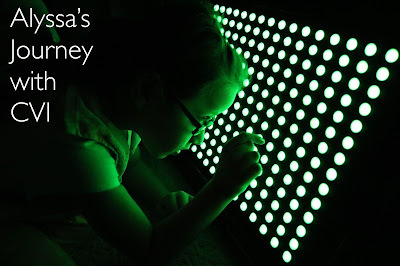 As her vision improved, so did her nystagmus and head control. 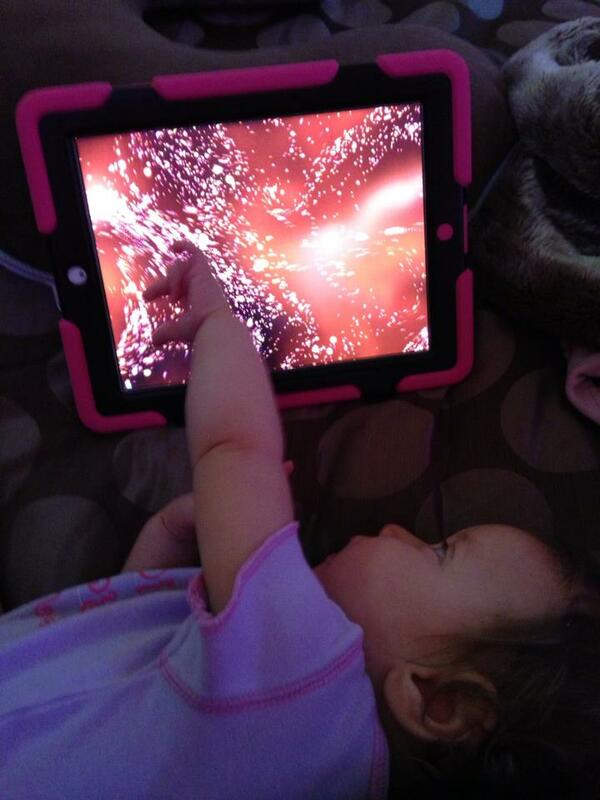 She finally started holding up her head after she was able to see objects better. It’s hard to explain, but it was as if her vision kicked in overnight. I met with a teacher for the visually impaired (TVI) in December of 2012. She was the first person to tell me about her visual impairment diagnosis. She told me that cortical blindness is more widely known as cortical visual impairment (CVI) because the children are rarely totally blind. She opened me up to a whole new world of endless possibilities. She was the first person to tell me there was hope—that my daughter COULD learn to see! That was all I needed to hear to get motivated to learn as much as I could about CVI. I spent weeks searching the internet for any and all information about CVI. Everything I learned about CVI was translated into her different therapies. Children with CVI have very specific characteristics and learning needs. 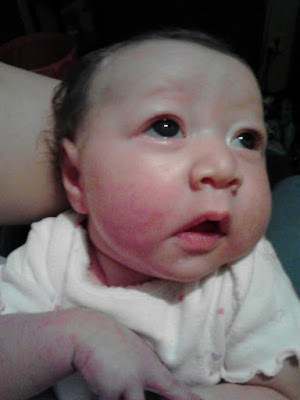 Once I knew how my daughter could see, I understood what I needed to do to improve her vision. 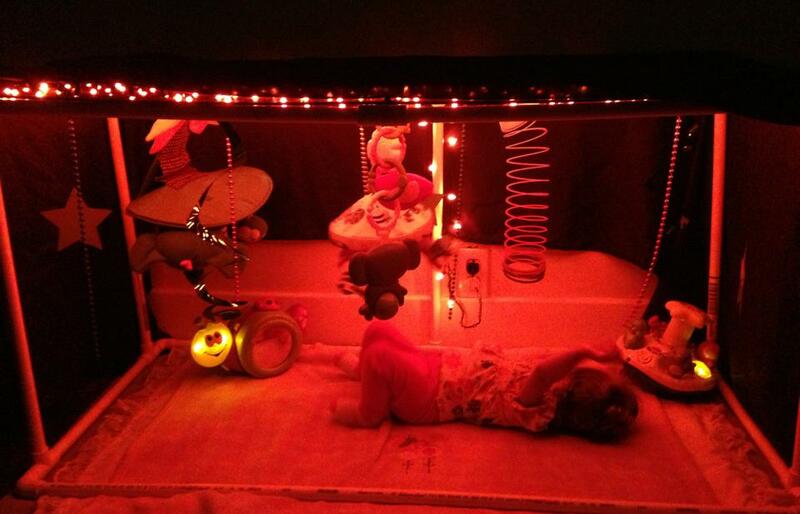 Her daddy built her a “little room” that had black curtains and objects hanging from the ceiling in her preferred color. Her therapists were wonderful with learning about CVI and things they could do in therapy to help her. She began to make drastic improvements in her vision, as well as her motor skills and physical strength. She started rolling over at eight months old; and by that time she had great head control. 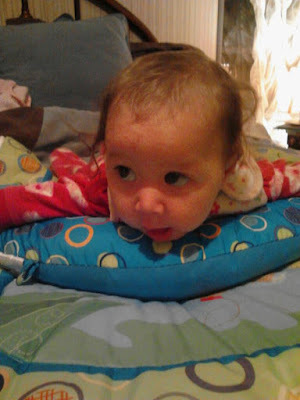 When she turned one on May 22, 2013, she was rolling everywhere, sitting up with her hands out for 30 seconds and saying a few words. 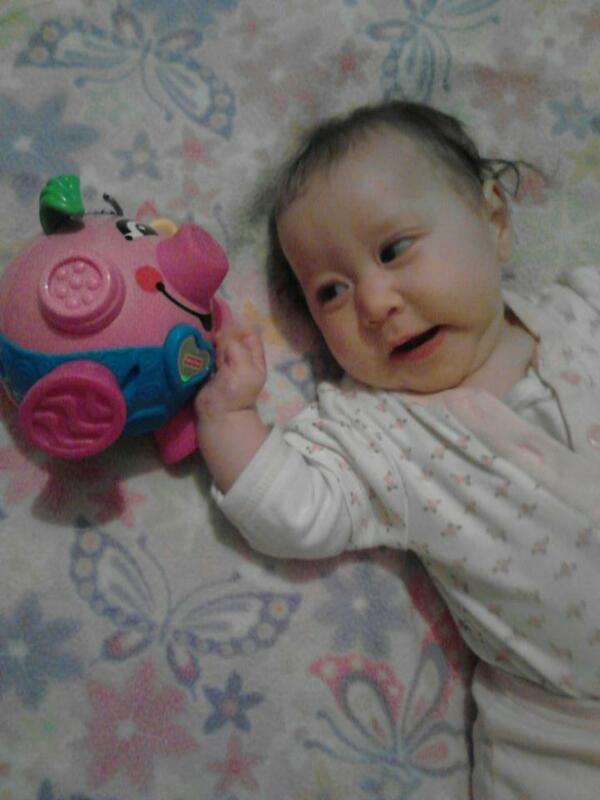 Her first word was “Bubba” at around ten months old. 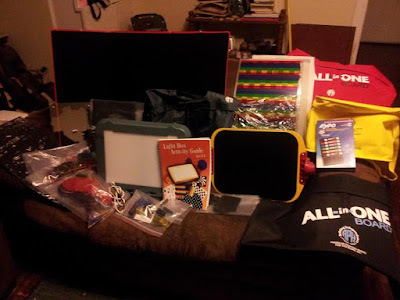 When Alyssa was 15 months old, she started Project IMPACT at the T.K. Martin Center for Technology and Disability, a special needs preschool in Starkville, MS. We moved our family over an hour away to be closer to Alyssa’s school and therapy center. It was at Kids Therapy Spot in Starkville that Alyssa started working with an occupational therapist that was experienced in working with children who have CVI. Through the therapist’s leadership and training of Alyssa’s additional therapists and teachers, Alyssa continued to make great progress with her vision. Alyssa uses a Light Box at school and in therapy. She also uses a LightAide that was purchased through generous donations from family and friends. Alyssa is now in her sixth year at T.K. Martin. 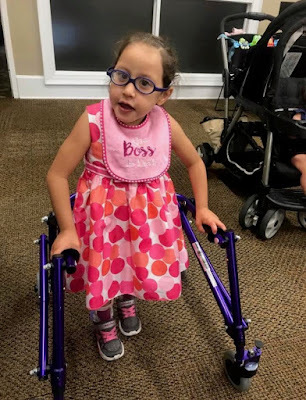 Her teachers and therapists continue to implement CVI strategies into her daily routine based off of the CVI Range Assessment (Roman-Lantzy). They have been an intricate part of her overall success. We have been very fortunate to have such a hands-on team approach. Over time, we have learned what works best for her and what doesn’t. There are times she needs visual breaks when she may have sensory overload or when she gets exhausted from using her vision a lot throughout the day. Children with CVI are never completely “cured” of their visual impairment, but hope is far from lost. CVI is the health crisis most people have never heard of. Now is the time for us to change that! The best thing we can do to help children with this visual impairment is to spread CVI Awareness. Through doing so, we can guarantee more children receive a proper diagnosis and have access to appropriate early intervention by trained professionals. CVI is a brain-based visual impairment that affects the way the brain interprets what it sees. The individuals' eyes may be functional, but the necessary connections in the brain have been damaged. Thirty to forty percent of children with visual impairment have CVI in developing countries. An estimated 85% of children with CVI have additional disabilities. With the advancements in technology, more premature babies are surviving, resulting in greater numbers of children having complications associated with preterm delivery. There are many causes of CVI, such as oxygen deprivation, stroke, cerebral palsy, hydrocephalus, and microcephaly. Other etiologies in children and adults include traumatic brain injury, congenital anomalies, central nervous system infections, neonatal hypoglycemia, and seizures. Children who present with these conditions should be screened for CVI. CVI is diagnosed by an MRI, an eye exam that does not explain the loss of visual function, a medical history that includes neurological problems, and the presence of the visual and behavioral characteristics of CVI. Because CVI can be difficult to diagnose, parent’s should stay adamant about finding professionals who can properly assess their child. Children diagnosed with CVI have a better chance of improving their functional vision by having a trained professional perform the CVI Range Assessment (Roman-Lantzy) to decide which phase they are in. CVI is broken into three phases—Phase 1 is the worst and Phase 3 is the best. Once properly assessed, the teachers and therapist will be able to develop a strategic plan based off of the child’s specific needs, allowing them adequate access to their visual surroundings. Children with CVI have unique and specific needs based off of the degree and location of their neurological damage. 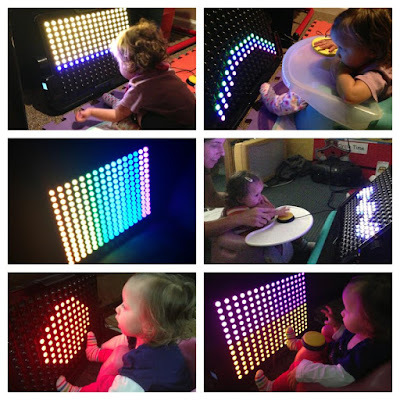 Different tactics are needed for each child since some respond to specific colors while others may respond to light. Children with CVI may have difficulty recognizing faces or distinguishing facial expressions, accessing information in a cluttered environment, interpreting drawings, perceiving depth, distinguishing between background and foreground, and may have better peripheral vision than central vision. 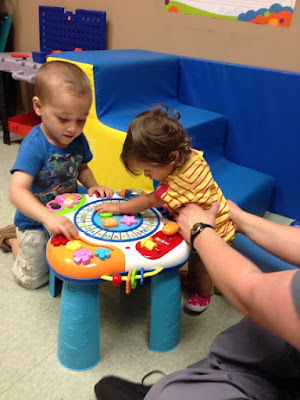 Children with CVI may also see better when an object is moving. 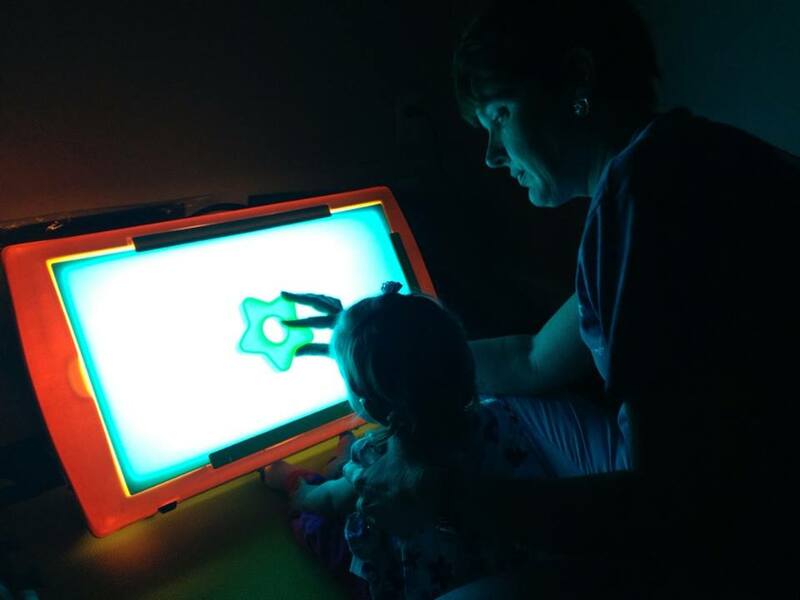 Light fixation and light sensitivity are also common among children with CVI. Children with CVI may also get fatigued rather quickly and need frequent visual breaks. Many people go through life consumed by their never-ending to-do list—causing them to spend less and less quality time with the ones they love. That pile of laundry and those emails waiting in your inbox—they can wait. Your children need your attention more. Finding the balance between work life and home life is challenging. Quality time is the key to connecting those two worlds and creating a family dynamic that is impenetrable. I was reminded of this recently by my two-year-old daughter while we were running errands. She was having fun playing with LEGOs while I was getting my tire repaired. When it was time to go, she started crying and saying she wanted to stay and play. I normally would have viewed her outburst as a typical toddler tantrum, but at that moment I slowed down long enough to really listen to what she was saying. I had a choice to make. I could either go home and let my daughter play there while I did the work I needed to do, or I could spend quality time with her doing something she enjoyed. I chose quality time—and here’s why.